BERLIN, GermanyBuilding on one of the most architecturally and sonically impressive music venues in the world, the Berlin Philharmonic recently added a HARMAN's Soundcraft Vi3000 console to its Chamber Music Hall, which was already equipped with a Soundcraft Vi6 and a Studer Vista 9 console. Home to the Berliner Philharmoniker, one of the world's top orchestras, the Chamber Music Hall caters to top-caliber musicians with its state-of-the-art design and equipment. 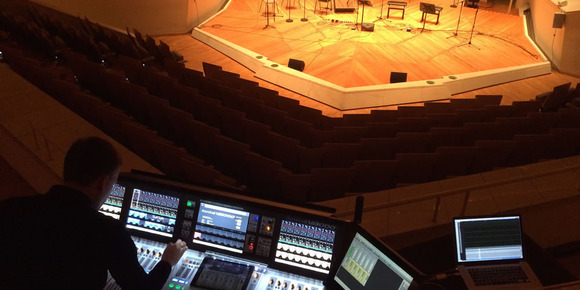 "We have experienced five good years with the Vi6, before we decided that the new FOH desk is going to be a Vi as well," said Mirsat Neziraj of the Berlin Philharmonic. "We love the intuitive design of the surface of the Vi Series. The instruments are clearly arranged on the channel strips, making the handling almost feel like analog desks, which in our opinions still have the best user interface. We especially wanted the Vi3000, because of the built-in stagerack which allows us to eliminate the side rack we used to have." Since the musicians of this orchestra stand in the forefront of their professions, it is essential that they are provided with the best instruments and their sound to be mixed with the world's leading technologies. To this end, one of the studios was configured in 2013 to house the Studer Vista 9 console for 5.1 mixes and recordings at 96kHz. "The consistent and fast operating concept of the Studer Vista has impressed us from the start," said Marco Buttgereit, a member of the audio team. "Because we often have guest sound engineers using our studios, it is important that they are able to familiarize themselves quickly with the technology." The high standard that Neziraj maintains is important not only for the in-house orchestra, but also for the different user groups such as freelancers, apprentices/trainees and touring sound engineers that use the consoles. Thanks to the analog-like feel, "they should be able to work on the desk without much training," he said.